WhatsAppMD rolls out with an updated material design because of the late Official release of Updated version of Whatsapp for Lollipop users. 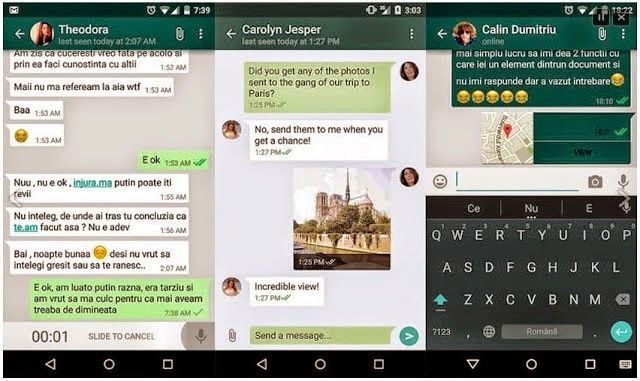 The original application is behind with the user interface, and because many fans got tired of waiting to run WhatsApp on Lollipop with an old design, a developer named Joaquin Cuitiño created an improved version and promoted it in the Google+ community. If your device runs on Android 5 Lollipop you can install this WhatsAppMD version, Apk v2.1.0. Likewise WhatsApp Plus, WhatsAppMD is considered a threat to the original version, and Zuckerberg wasn’t too pleased to see new competition, and asked his lawyers to fight against Joaquin Cuitiño and make him withdraw his application. In addition, he blocked Joaquin’s Facebook account, which made him say that he’ll stop developing the application if his account will be restored. But we’re pretty sure that WhatsAppMD will continue to be used by many people who are disappointed of the original application, because it misses some features and option that are found on the WhatsApp Plus and WhatsAppMD. But in this article, we’re referring to the second alternative, and we’ll recommend you the 2.1.0 version, which is inspired from the last builds of the Android Lollipop and has an incredible material. the digital camera icon from the chat text field was eliminated; the WhatsAppMD model information is now shown on the display and the attach black background in MDPI was fixed. On 22 January was released the 3.0.1 (Patch) which in Android 5.0.0 shows again the FAB labels. Overall, in all Android versions, this version added WhatsApp Web to overflow menu, replaced all blue drawables to teal accent color, fixed send and emoji button and fixed the avatar padding in conversations list.